This past week I covered quite alot of piano homages/fantasies/variations on Beethoven's music by other composers...so I might as well finish it out with a couple more to make it a theme (no pun intended). The eight variations plus a fugue, presto, and coda are based on the Trio from the Menuetto third movement of Beethoven's Piano Sonata No. 18 ("Hunt"). It is a fairly strange choice for a theme; its short phrases consist of leaping chords followed by a brief, more melodic figure. On the other hand, it is perfect from a duo standpoint because the chords echo and are easily split between the two performers. Saint-Saëns' variations are comparable to Beethoven's own variation writing in their diversity of style and complete pianism. 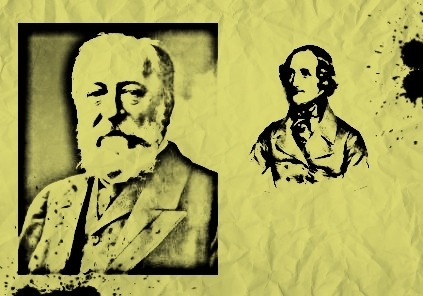 Saint-Saëns was able to use the two pianos to create almost orchestral sonorities, yet keep the music accessible to moderately skilled players. The variations move from an arpeggiated version of the theme to a filled out lyrical version, a partial inversion, pounding chords, and another arpeggiated version before heading into a funeral march. The march and the following section both feature exotic harmonies that give a more mysterious and Eastern flavor to the music. The fugue, presto, and coda are the meat of the work, requiring a certain amount of élan and a considerable amount of ensemble skill to be done well. Using an earlier master's work as inspiration, Saint-Saëns crafted a classic work for the piano duo repertoire. Another work inspired by Beethoven I accidentally stumbled upon is Thalberg's "Souvenirs of Beethoven" - this one uses themes from the 7th and 5th symphonies - I suppose if you're going to take souvenirs they might as well be big ones. From Allmusic: Souvenirs de Beethoven: Grande fantaisie pour le piano sur la 7' Symphonie de Beethoven, Opus 39 was written in the 1830s and finally published in 1840. It starts with a passage that, in its figuration, seems to justify Liszt's apparent reference to Thalberg as the Chevalier de Tremolo. There are distant suggestions of Beethoven's Seventh Symphony, duly transformed, before the emergence of the principal theme of the Allegretto of the second movement, here marked Andante, material which is then subject to pianistic embellishment of increasing brilliance and intensity. The A major section, transformed from its original, follows, before a due return to A minor and further delicate display. Reminiscences of the last movement of the symphony lead to other territory, now the final movement of the Fifth Symphony, but it is to A minor and the second movement of the Seventh Symphony that the Fantasy finally returns.